by Bill Dwight on Friday, December 04, 2015 at 6:10 PM | LEAVE A COMMENT! “No thank you,” said no kid ever. That’s right. No kid is going to hate you for handing over cold hard cash as a present this holiday season. The same holds for gift cards, as long as you get the brand right. That might be a little trickier than you think, judging by the billions of dollars worth of unused gift cards floating around out there. And while cash and gift cards aren’t the most imaginative gifts, at least some folks get pretty darn creative on the packaging. Maybe you can even try your hand on some clever money origami this year. Still, wouldn’t you feel a bit more thoughtful giving a financial gift that isn’t purely focused on immediate consumption? Perhaps something a bit longer term and, dare I say, educational? I know what you’re thinking. Yawn. But bear with me, I’ve got some cool options that are worth your consideration. What could be a better stocking stuffer than stock? Well, almost anything it turns out. Traditionally, giving stock to kids has been a huge hassle. But SparkGift just changed that. Now, with minimal effort, you can give a kid as little as $20 worth of a favorite stock — or even an ETF. (Hurray for teaching kids about low cost diversification!) All it takes is a few clicks and a very nominal one-time fee. And, yes, you can buy fractional shares. Apple and Berkshire Hathaway fans, take note. Investing is one of those things that many adults wish they had learned earlier as kids. Now you can easily help your kids avoid the same fate. Be sure to check out these recent SparkGift reviews in TIME, Re/code, and MainStreet. SparkGift is also mentioned on this week’s Motley Fool Answers podcast episode: The 2015 Holiday Gift Guide. Speaking of the Motley Fool, consider pairing your gift of stock with their highly rated book The Motley Fool Investment Guide for Teens: 8 Steps to Having More Money Than Your Parents Ever Dreamed Of. Maybe it’s something you can read together — a chapter at a time each week. I’d also recommend setting a quarterly date on the calendar to check in on the stock performance together. If you give your child both an individual stock and an ETF, you’ll be able to have some wonderfully concrete discussions about the relative merits of betting on a single stock versus holding a diversified index. If you choose an individual stock, you can throw in a related gift card to spice things up — like an iTunes card for Apple (Ticker: AAPL) or a “Life Is Burritoful” card for Chipotle (Ticker: CMG). Well, college is knowledge (plus beer), and it turns out you can give a fractional share of college with minimal hassle too! GiftOfCollege makes it easy peasy for family and friends to contribute to your kid’s college savings plan. Just order one of their gift cards online for as little as $25. You’ll quickly realize this is no small miracle once you start poking around the gazillion 529 plans out there and seeing what it takes to make a gift contribution. We’ve even outlined a way your youngster can get some shared skin in the college savings game with just pennies a week. See here. There’s zero doubt that getting started early on the college savings plan and having your child share some skin in the game is a smart parental move. But being smart isn’t most kids’ typical idea of holiday fun. 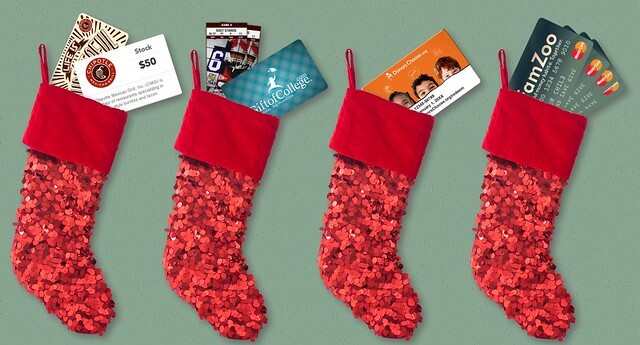 So I recommend combining your Gift Of College card with some tickets to something at the local university campus that matches your child’s interests: a sporting event, a play, a concert, summer camp, etc. Kids dig the college campus atmosphere. The more your kids can envision what it’s like to be in college, the more motivation they’ll have to participate in the savings process beforehand. Did you know there’s a “drug” out there that you can sneak in your kids stocking for a safe holiday “high”? Yep, it’s called altruism dude! In fact, fMRI data shows that the decision to donate to charity lights up the nucleus accumbens area of the brain which contains neurons that release the pleasure chemical dopamine. Brain nerds can read more here. So slip a DonorsChoose gift card in your kid’s stocking this year. It’s one of my favorite sites for introducing kids to charitable giving, and I explain why in this post. Be sure to review these 6 tips for engaging your kids in philanthropy first. Order a family pack of FamZoo cards with spending, college saving, investing and giving cards for your child. Define a split that allocates your kid’s earnings — whether its allowance, chore, odd job, or birthday money — between the four buckets. Set up an activity alert for the spending card so your child can see the remaining balance immediately after every purchase. The alert makes spending more mindful (more like cash) and makes it much easier to stay on budget. Set a goal for the investing card to accumulate enough funds for a future share purchase in the custodial account opened with SparkGift — at least $20. Set a goal for the college saving card to accumulate funds for a future contribution to the 529 through GiftOfCollege — at least $25. Set a goal for the giving card to accumulate funds for a future contribution to the DonorsChoose — at least $50 to get student thank-you letters in the mail. Now there’s a financial gift that covers all the bases and keeps on giving year in and year out. All that said, if you take the time to fold a $20 bill into an origami armadillo before giving it to your kid, you deserve major props too! Do you have a creative financial gift idea for kids? Please share!